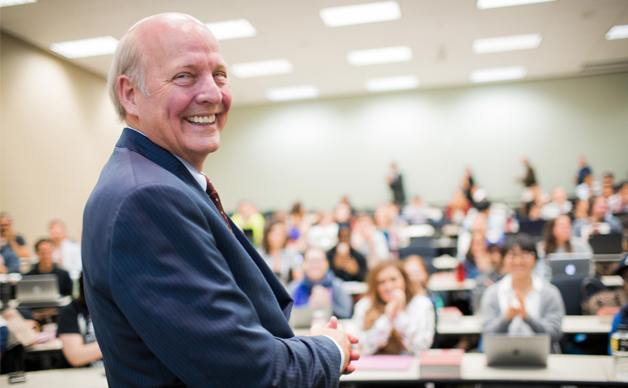 After thirty-seven years, Frank S. Alexander, Sam Nunn Professor of Law and founding director of the Center for the Study of Law and Religion, will conclude his teaching career at Emory Law at the end of this academic year. Ever since my first Law School class in January 1981, I have been blessed in so many ways. I have been blessed by the students – by their enthusiasm, their curiosity, their inspiration. I have been blessed by the staff – by their service, their commitment, their patience, their kindness. I have been blessed by the faculty – by their mentorship, their guidance, their creativity. I have been blessed by the University – by its interdisciplinary reach and by its dedication to education. It has been a great privilege and honor to be a part of this community for these many years. Professor Alexander served as interim dean of the law school (2005-2006), and as visiting fellow at the Joint Center for Housing Studies, Harvard University (2007). His courses have included Property, Real Estate Finance, State and Local Government Law, Law and Theology, and Federal Housing Policies. He is the author of more than sixty publications in the fields of real estate finance, law and theology, and community development. Professor Alexander's work in recent years has focused on community development and affordable housing. He is the co-founder and senior advisor of the Center for Community Progress, a national not-for-profit entity that provides technical assistance to local and state governments in the conversion of vacant and abandoned properties into productive uses. From 1993 to 1996, he served as a fellow of the Carter Center of Emory University, specializing in neighborhood redevelopment activities and low-income housing in conjunction with The Atlanta Project. He served as a commissioner of the Georgia Housing Trust Fund for the Homeless from 1994-98. In May 2008 he testified before Congressional subcommittees on the Housing and Economic Recovery Act of 2008, and in November 2009 on strategies to address the mortgage foreclosure crisis. Within the University, Professor Alexander is the recipient of the Emory University Thomas Jefferson Award (2006), Outstanding Service Award from Emory University School of Law Graduating Class of 2006, the Crystal Apple Award for Excellence in Professional School Teaching (2005), the Student Bar Association Award for Most Outstanding Professor (2018, 2015, 2014, 2010, 2004), the Inspiration Award for Outstanding Leadership in the Public Interest from the Emory Public Interest Committee (2002), the Laura Jones Hardman Crystal Apple Award for Excellence in Teaching and Service (2001), the Ben F. Johnson Faculty Excellence Award (1998), and the Emory Williams Award for Distinguished Teaching in Professional Education (1991). Outside of the University, Alexander is the recipient of The George A. Pindar Award, Real Property Law Section, State Bar of Georgia (2006), the Good Apple Award, Georgia Appleseed Center for Law and Justice (2009), the Outstanding Service Award of the Atlanta Legal Aid Society (1996), the Georgia Affordable Housing Award for Individual Initiatives (1995), and the Citizen’s Award for Outstanding Service from the Fulton County/City of Atlanta Land Bank Authority (1995). Over the course of his time at Emory, Alexander has financially supported numerous programs and student initiatives at the law school, with his top priority always being the creation of the permanent endowment to support public interest and public service summer fellowships through EPIC. Alexander’s presence at Emory Law will be dearly missed.